My team and I at WeRobotics recently teamed up with Emprende and other partners in the Dominican Republic (DR) to field test the delivery of cargo by drone. A more detailed and technical report is being prepared; similar to the one we published on our cargo drone field tests in the Peruvian Amazon Rainforest. In the meantime, this blog post serves as a short overview of the project, which was kindly supported by the Inter-American Development Bank (IADB). We programmed the DR drones to transport medical supplies between local hospitals and remote villages in the mountains, several hours north of Santo Domingo. In addition to the tests, we provided local students and others with hands-on training on how to operate both multi-rotor drones and hybrid drones for cargo delivery. Building local capacity is central to our work at WeRobotics. Transporting medicines and patient samples between hospitals (the red markers on the map above) and remote clinics (green & purple markers) in the mountains of the DR can be slow and expensive. While roads to these remote clinics do exist, they are not always paved and those that are paved are sometimes impassable due to the rivers that cross them, even during the dry season. Furthermore, while the road network in the mountains of the DR is impressively widespread, the local ownership of motorized vehicles is certainly not, nor is the availability of public transportation. Villagers in these remote regions earn very little income and do not have the time to spend an entire day traveling to and from the nearest hospital to get their blood tested even though said hospital may “only” be 20 or 30 kilometers away. The reason this takes a day is because there is often only one “bus” (usually a truck) that goes to and from town once a day, leaving early in the morning and returning mid-afternoon. And the “bus” is obviously not free. Some patients are in pain, and simply unable to just “hop” on the back of a truck driving over bumpy roads for an hour or more under the sun. As such, doctors working at these hospitals and clinics are keen to explore other ways to expedite the collection and testing of patient samples and distribution of essential medicines. In some cases, remote villages will have a small clinic. But these small clinics often lack a continuous supply of medicines. This is particularly problematic for patients who need to take specific medicines on a regular basis. What’s more, sending patient samples that require a specialized laboratory for testing purposes and then receiving results of this testing is also a cumbersome task that becomes complicated. These logistical challenges can potentially be alleviated by introducing the use of cargo drones. Emprende invited WeRobotics to build local capacity and evaluate the use of drones for the collection and delivery of patient samples and medicines, and to field test two drones in the process. This local training and cargo flights took place over a 10-day period in two different mountainous regions of the DR. The training and flight operations were carried out in partnership with Emprende and other stakeholders. The purpose of these tests was to better understand the opportunities and limitations of using affordable solutions for the rapid delivery of essential supplies in the DR. As such, the field tests sought to better understand the failure points and failure rates of the technology while developing streamlined workflows to enable the safe and regular delivery of essential items in the DR. Understanding failure points and rates is essential to developing a preventive maintenance strategy. The latter serves to increase the reliability and longevity of aircraft. In addition, understanding the limitations of affordable solutions in relevant social, geographical and environmental contexts was one of the overarching goals of the field tests. The field tests were carried out using 2 types of general-use drones that were adapted for cargo delivery: DJI’s M600 hexacopter drone and Vertical Technologies’ DeltaQuad, a new VTOL (Vertical Takeoff and Landing) fixed wing drone, also called a QuadPlane configuration. A total of 31 complete flights were logged (not counting shorter test flights). The types of cargo transported included items of up to 2kg including water, sample tubes, some medicines and even avocados and energy bars for testing purposes. The distances covered by the cargo drones ranged between 5 kilometers and 12 kilometers, with an altitude difference of up to 250 meters in altitude between takeoff and landing. Three technical failures were experienced and exhaustively investigated. These are detailed in the upcoming technical report. The growing healthcare needs in the DR coupled with expensive and slow cargo delivery options makes it clear that alternative solutions are needed. Our recent trainings and field tests in the DR confirm that cargo drones can be part of the solution. That said, more field research needs to be carried out to identify the most compelling and sustainable delivery routes in the DR. This research is currently being conducted by Emprende in partnership with local universities. From Aerial to Maritime Robotics for Payload Delivery? WeRobotics is co-creating a global network of social innovation labs to accelerate the transfer of appropriate robotics solutions to local partners who need them the most. Launched last week at the prestigious 2016 International Drones & Robotics for Good Awards in Dubai, WeRobotics seeks to democratize the Fourth Industrial Revolution. 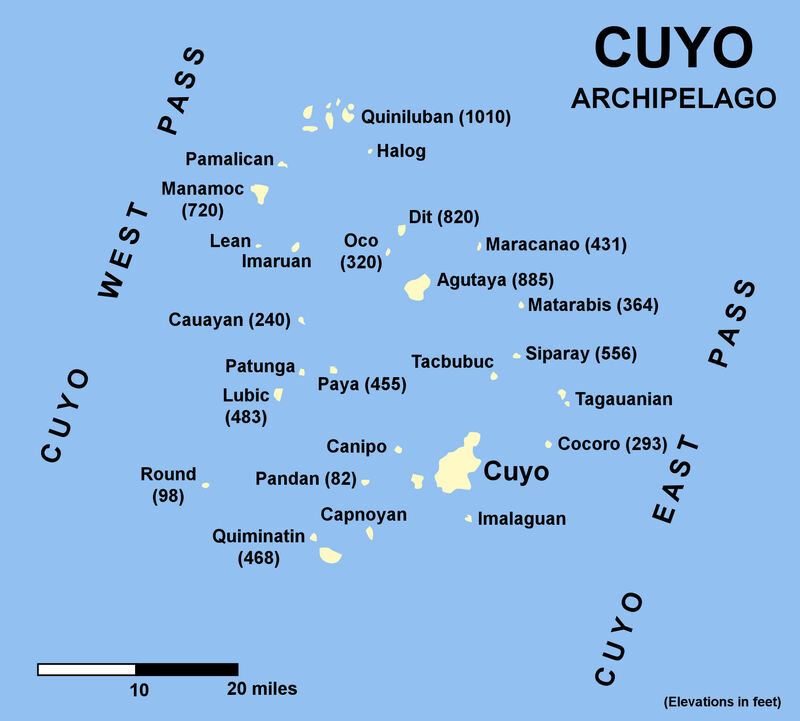 One of several new labs under consideration is Cuyo Flying Labs in the Cuyo Archipelago of the Philippines. Our local partners in this district are outstanding public health professionals who have made a clear and data-driven case for exploring robotics solutions to improve the delivery of essential medicines across the islands of the Archipelago. WeRobotics has reached out to it’s network of Technology Partners to identify a cross-section of aerial robotics solutions. We plan to pilot and evaluate these solutions together with our local partners this year; just waiting to hear back on a number of grant proposals. Aerial robots are not the only robotics solutions out there, however. Indeed, a number of contestants at the International Drones & Robotics Awards presented maritime robotics platforms. One team from NYU Abu Dhabi presented their Reef Rover solution, which I gave high marks to (I served on the panel of judges for the finals of the championship and also had the honor of giving the opening Keynote). Fellow keynote speaker David Lang from OpenROV also presented his group’s maritime robotics solution. So I caught up with David and told him about the possible Cuyo project. I asked him about possible autonomous maritime robotics solutions that could carry a 1- 2kg payload across a 20-mile stretch. Given that GPS signals and radio waves do not travel well underwater, the solution would need to be a surface-water robot. That said, Team NYU did come up with a neat solution to this issue as shown in the above video. But said solution may be problematic for long distances. In any event, I was surprised to learn from David that existing surface-water robotics solutions would likely range in the hundreds of thousands of dollars. So I asked David about possibility hacking a remote control boat since these toys cost a couple hundred dollars at most. This could totally be done, according to David. He encouraged me to blog about the humanitarian applications of small autonomous boats and to share my post with the DIY community for feedback. So here we are. I also did some research on autonomous boats and came across this high school project—aptly titled DIY boat—along with the short video below. These kinds of boats can travel between 10-25 miles per hour. Battery power won’t be an issue but salt water and robotics are not the best of friends. So developing a persistent & robust solution with sense and avoid technology will need more thought. I also found this more recent article (February 2, 2016) on swarming robot boats that apparently demonstrate learning. More on this applied research project in the video below. As for operating this in Cuyo, we could test out the autonomous boat late at night when no commercial boats or fishermen are likely to be out and about. The water routes would be automatically programmed so the maritime robot would simply do several runs back and forth. In other words, even if the boat can “only” carry 1kg-2kg at a time, the frequency of the trips could make up for the low payload weight—just like aerial robotics. Of course, we’d have to look up the Philippine’s maritime regulations to figure out what kinda of permits might be necessary, but I assume these regulations may not be as demanding as aviation regulations. In any event, WeRobotics seeks to work across multiple robotics platforms, from aerial robotics to terrestrial robotics to maritime robotics. For now, though, most of the world’s attention is focused on the hype surrounding small autonomous aerial robots. But aerial robotics won’t be the one and only wave of robotics to impact the social good space. So f you know of existing maritime solutions that we could pilot this year as part of Cuyo Flying Labs, then I’d be most grateful if you could either get in touch or leave a comment below. Many thanks! 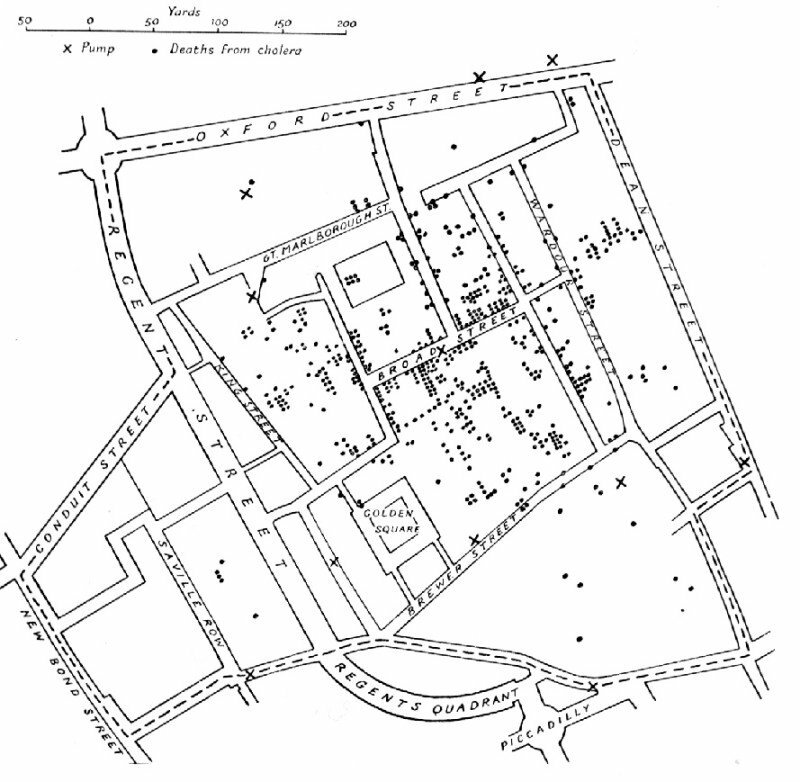 Doctor John Snow’s cholera map of 1854 is often heralded as an example of how mapping can illuminate powerful insights on otherwise hidden patterns. Not so, writes Mark Monmonier in his excellent book on “Spying with Maps” which I just reviewed here. Although Mark is rightfully critical of Dr. John Snow’s legendary map, the last sentence above is quite insightful. The map, while unhelpful in knowledge discovery of cholera’s source, did become “eminently useful” to influence public health policy. Crisis Mapping is by definition a cross-disciplinary field. Crises can be financial, ecological, humanitarian, etc., but these crises all happen in time and space, and necessarily interact with social networks. We may thus want to learn how different fields such as health, environment, biology, etc., visualize and analyze large complex sets of data to detect and amplify or dampen specific patterns. We can’t all become specialists in each others’ areas of expertise but we can learn from each other, especially if we share a common language. Like the field of complexity science, Crisis Mapping can provide a common but malleable language, taxonomy and conceptual framework to facilitate the exchange of insights driven by innovative thinking in diverse fields. This explains why I was excited to come across the International Journal of Health Geographics a few days ago. The Journal is an online and open-access resource. This means new ideas can be shared openly, which is conducive to innovation, just like arXiv. This study developed a spatially explicit epidemiological model of infectious disease to better understand how contagious diseases spatially diffuse through a network of human contacts. To do this, the authors developed an agent-based model (ABM) that integrates geographic information systems (GIS) to simulate the spatial diffusion. (See my previous post on ABM and crisis mapping). What is very neat about the authors’ approach is that they chose to draw on georeferenced land use data and census data. In other words, they combined the fomalistic rules of ABM with empirical GIS data. This means that the model can actually be tested and different scenarios can be played out by adding or changing some of the parameters. Could we use this model for conflict contageon? It’s worth noting that the above Google Earth imagery was not particularly high resolution but the authors were still able to make full use of the imagery. 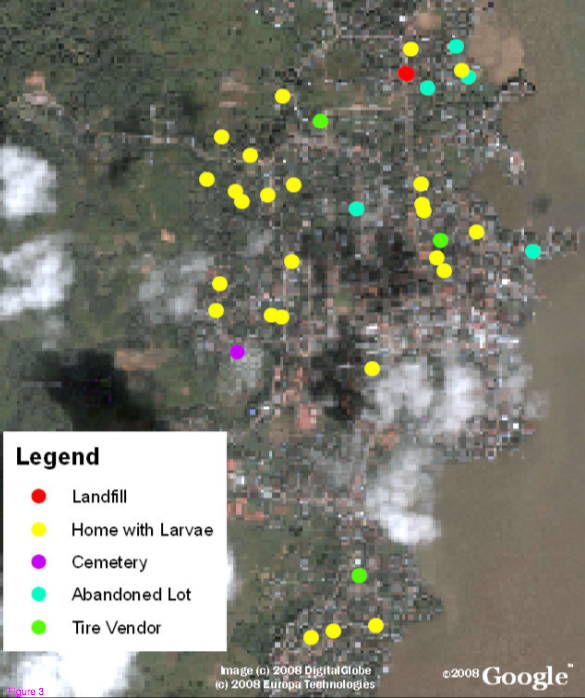 While the team had a free copy of ArcGIS thanks to the Global Fund, they plan to consider free and low-cost alternatives such as SaTScan, MapServer and Quantum GIS in the future. (See this post for additional alternatives like GeoCommons). I hope the authors also know about Walking Papers. I’ll email them just in case. Here’s to cross-disciplinary collaboration!